the most exemplary and personalized service our customers have ever experienced. 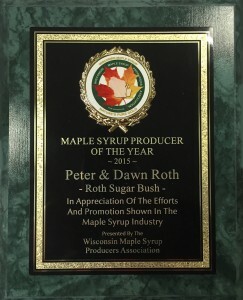 Roth Sugarbush was started in 1956 by John & Pat Roth. 120-acres of their 580-acres farm was maple trees so making syrup was a natural hobby for them. They began by tapping 200 maple trees and producing 40-50 gallons of pure maple syrup. By 1959, John was tapping 2,500 trees and producing 600 gallons of maple syrup requiring John and Pat to expand into a local, vacated cheese factory. In 1974, they began selling the equipment used in the process, and the business continued to grow. We have recently moved to a new location at 656 Tower Drive located in Cadott off of Hwy 29 & Hwy 27. Roth Sugarbush now taps 7,000 of our own trees and purchases sap from 3,000 more trees tapped by other producers. With the production of maple syrup, we supply many wholesale and retail outlets. We even export our product to Japan! 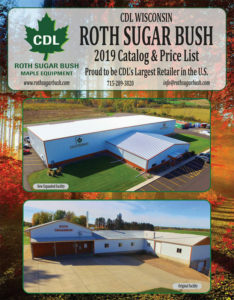 Along with the production of pure maple syrup, we are also one of Wisconsin’s leading distributors of maple equipment. John and Pat’s hard work went beyond working the farm and the maple syrup business. They also raised three wonderful children: John Jr. (Mike), Jane and Peter. Their work ethic carried on to the younger Roth generations. In 1993, John and Pat sold the dairy portion of the farm to their son, Mike, and they sold the maple business to us, Peter and Dawn, in 1995. We also have two daughters, Chelsey and Samantha. Both of our girls are now married. Chelsey and her husband Derek as well as Sam and her husband Kellen both take part in the business now as well. Our fourth generation of syrup makers is up and coming as we have two grandsons Parker James and Reilly Kellen. We pride ourselves on our family-run company!!!!!! Click here for Presentation Pictures and the Story!